Going to university can be a daunting prospect - there's the cost to consider, as well as moving away from your friends and family and having to manage on your own, perhaps for the first time. But, what if there was an alternative to uni, one which still gave you a degree but didn't leave you with debt and which looked out for you? Here three of the degree’s first students tell it like it is. Has the first year of the course lived up to your expectations? "The job is not what I expected at the start. The job requires a lot of skill, knowledge and customer service which I didn’t think would be required," admits Sam Brown, aged 19. "Not really, I am not sure if growing up is ever how anyone has ever imagined. It’s just growing up and balancing working and university which is the challenge," says Ashley Mutambarade, also 19. "Not at all. I thought it was going to be more exam based, but it is all coursework which is less stressful," explains Neil McDonald, 19. So, what were the best bits and the hardest bits? "The best part of sales has been hitting 15 per cent bonus and the sense of achievement you get from selling," says Sam. "The hardest part is the days you can’t sell. It's challenging not to get frustrated because you want to do well. You need to understand you will have good days and bad days and move on." "Meeting new people and growing up, as hard as it is, comparing myself to my friends that just went to university, gaining experience," says Ashley. "The hardest bit has been being far away from home because I’m from Leicester in the Midlands, I was initially really home-sick but the support has been amazing. When I had bad days of feeling home-sick there was always someone to go to." "The best bit has been making new friends and learning about a subject which is very compelling and new which is a good challenge for me," says Neil who admits "Balancing out work and study has been a challenge." Students move around different departments within the company – which is the best so far? "Younger and Wiser. The department is really friendly with a customer base that I relate to. It is much easier to help people if you can relate to their situation. Being younger helped me to communicate with customers and find something to match their needs." explains Sam. "Older and Wiser is by far the best, I have the most amazing team leader and the atmosphere with the team is amazing. In all honestly I have enjoyed ALL the departments the people in Be Wiser are great to work with," says Ashley. "Older and Wiser as it has been very relaxing and challenging at the same time, which has been good in the sense that I have been thrown in at the deep end to learn the tricks of the trade. Very useful for my development within the organisation," agrees Neil. Now it’s the end of your first year, how do you feel? I’m looking forward to finishing the year strong. I am focused on moving onto the second year and working towards a good degree qualification," says Sam. 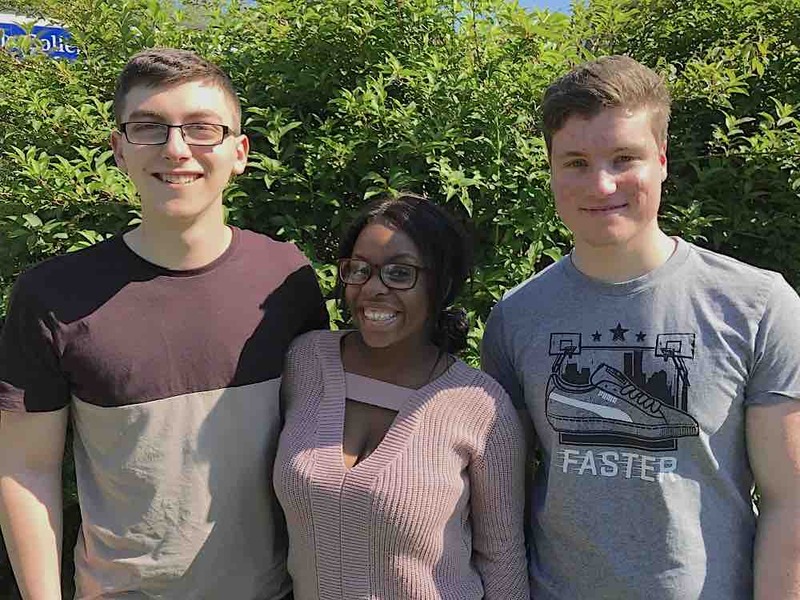 "Surprised the year has flown by, I’m feeling excited as well because the departments and rotations in the second and third year seem to be more exciting as we are going to explore management," explains Ashley. "I feel more professional and well on my way to have a successful career within the company," says Neil. are you still happy you didn't follow the 'traditional' university route? "Yes," says Sam. "My debt will not be high and I will have good work experience and a job when I finish." "150 per cent YES!," agrees Ashley. "I look at my friends and they are graduating this year and struggling to write a CV that has qualifications that resonate with experience they have gained over their years. " what would you say to others considering this qualification? "It is a good option if you are looking to go into the insurance industry. It provides a good balance of a job and study and with a reduced debt it is well worth it if you’re deciding between a job and university," counsels Sam. "I would say weigh up the options, think about it clearly," advises Ashley. "The traditional route is good but this opportunity gives you the ability to gain both qualifications and experience which opens so many opportunities. Not just that, but by the age of 21 I’ll be earning £28000 with a debt free degree. I think it’s knowing that, and it’s looking to your future and seeing what will open up more opportunities." And Neil adds: "It’s a huge opportunity to have a very successful career at little expense – seems to be a no-brainer!"